Ja, ich abonniere ab der nächsten Ausgabe für mindestens ein Jahr. 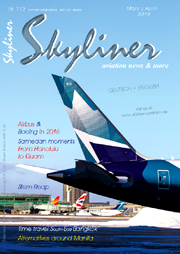 6 x Skyliner - aviation news & more zum Preis von zur Zeit 36,-- € inkl. 7% MwSt. und Versand. I would like to subscribe from the next release for one year. Subscription is automatically renewed for one year if no written cancellation is received six weeks before end of current subscription period.